I continue to think that modularized auxiliary cruisers could provide a mobile reserve for the small footprints of US forces across the continent (and to extend operations south of our footprint in emergencies) as I outlined in "The AFRICOM Queen" in Military Review. Right now our ground reaction forces are limited to Spain, Italy, and Djibouti, leaving large parts of an already huge continent out of easy reach. Even though the auxiliary cruiser used as a power projection platform could only directly reach the littorals of Africa, the footprint on land would allow assets from the sea to leap frog inland across those lily pads. And really, only if you haven't paid attention this is a surprise to you. 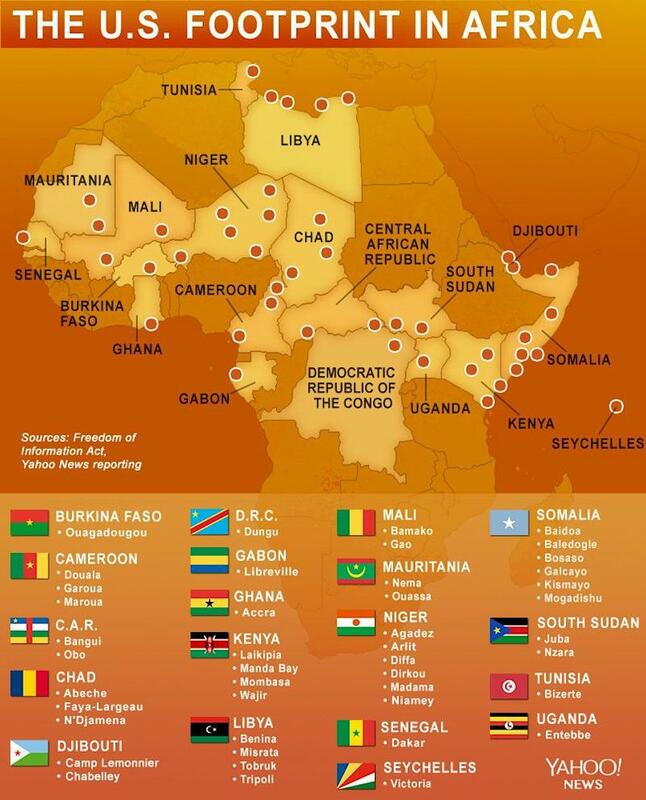 But it is well known that AFRICOM is an economy-of-force theater trying to prevent jihadi threats from rising to the level that it will require diversion of resources from higher priority theaters in Asia, Europe, and the Middle East. As I've noted before, I think the unofficial motto of AFRICOM is "Thank God for SOUTHCOM!" The command won't get a lot of military resources, but perhaps money to make an auxiliary cruiser or two could be shaken loose from the Pentagon. So It is a New Thing That Enemies Will Throw Everything They Have, Including the Kitchen Sink? By "conventional weapons" I assume he means conventional military units, since irregulars, terrorists, and criminals use "conventional weapons." Why is this considered so unique? Really, the Vietnam War was hybrid warfare with this definition. Our troops were constantly forced to balance conventional fighting against conventional military units--requiring our forces to concentrate--and irregular warfare that required our forces to break down and spread out to separate and protect people from insurgents, terrorists, and criminals. Don't waste so much time reinventing the wheel when we traveled so far down a road on the same invention already. By the time we left South Vietnam, the insurgency was defeated and the North Vietnamese army had been held at bay. Only a cut off of American aid and air power by Congress reversed those victories. And even the apparent Russian innovation in 2014 of sending troops while denying involvement was partially carried out by North Vietnam which funneled troops south to eventually take over the Viet Cong (who were shredded in the 1968 Tet Offensive) to AstroTurf a mass uprising. But at least we didn't go along with the North Vietnamese fiction, as our bombing raids on North Vietnam showed--unlike in the Donbas where we oddly seem to mostly go along with the Russian fiction that local rebels with more tanks than Germany, Britain, and France can field in their arsenal are the other side in the war with Ukraine. Just kill "hybrid" threats the same old way enemies have always been killed. Study what we did in Vietnam. The Marines are preparing for urban warfare. Which is really like assaulting a defended shore but without the need to get from ship to shore. So I'm good with this complementary mission. The Marine Corps plans to launch an urban-combat operations experiment this summer, and the service wants defense firms and academia to submit ideas for weapons and fighting technologies aimed at making Marine infantry units more effective in this deadly environment. The Marine Corps Warfighting Laboratory recently released a request for information to search for emerging and mature technologies to be included in a new "limited objective experiment" focused on dense urban operations, according to an April 15 solicitation posted on the government contracting website FedBizOpps. This will be a series of experiments held between August 2019 and August 2023, with the opening experiment set for August 1-30 at the Muscatatuck Urban Training Center in Indiana, according to the solicitation. Megacities are a thing we need to be prepared for. I hope part of what the Marines look at is what parts of a city they should seek to control when they go into a city. Surely there are core objectives to effectively control an enemy-held city for the purposes of advancing the military campaign without paying the price to fight for the entire city. For the Army, I'd like it focuses on mobile warfare. But I'd like some of our officers (or entire headquarters elements?) ready for that urban warfare mission with the skills mostly hosted in the combat engineers to support any Army units (with training and equipment given to them in preparation) that need to supplement the Marines, as I mention in this post. UPDATE: And of course the Army must have basics for urban combat well in hand because even outside of megacities there will be towns and villages to clear in a campaign. I'm just worried that the focus on megacities will drag the Army into urban Hellscapes when the Army doesn't need to enter them to advance the objective of a campaign. Turkey and Russia have a long history of warfare that argues against an enduring alliance. But an alliance that is fleeting is still a problem potentially. For both America and Russia. There are still myriad issues standing between the two countries, most recently their support of opposing sides in the Syrian war. Alliances require shared interests – not just opportunities for temporary cooperation but a long-term convergence on issues of vital importance. Forming new alliances, therefore, requires countries to adopt new interests or, at least, new strategies for pursuing their interests. In the case of Russia and Turkey, there’s little evidence this has happened. There were myriad issues that stood between Nazi Germany and the USSR allying. There were myriad issues that stood between alliance between the USSR and China. There are myriad issues that stand between alliance between Russia and China. But while those unnatural alliances hold they can cause problems. The same holds true for Russia and Turkey. And the history of conflict between the two is no longer heightened by bordering each other, sometimes with Turkey (then the Ottoman Empire) well north of their current northern borders. Russia (and the USSR) used to border Turkey in the east and Russia used to have access to Turkey in the west either through compliant or vassal states even when Turkey's border was not pushed north. So a Russia that would like to break NATO's hold on the Turkish Straits might want to ally with Turkey just to achieve that. And so a Turkey that would like to expand back into its old Ottoman Empire expanse (in influence if not territory) might want to ally with Russia who would be more cooperative than America. And both increasingly dictatorial states might see common interests in resisting the perceived threat of American democracy to their systems. In the long run, a Russian-Turkish partnership might not last long. But in the short run it could be a huge problem. Assuming Turkey isn't just reaching out to Russia to get a better deal with America, as Geopolitical Futures raises. That's normal behavior for smaller states despite Erdogan's dangerous path. But keep in mind that enduring histories of warfare can end. Britain and France had a long history of warfare--until they became allies. France and Germany had an enduring history of warfare. Until they didn't. America and Britain had a history of warfare and hostility that lasted over a century before reversing into a "special relationship." So the enduring history of warfare isn't necessarily predictive of whether Russia and Turkey might ally. And then there is the chance that Turkey going from an ally of America in NATO to an unsteady ally of Russia would only be a transition to Turkish alliance with China to gain a distant ally--and their military technology--against both traditional foe Russia and America which can be expected to oppose Turkish neo-imperial ambitions.. Which neither Russia nor America would like much. If the Russians had any sense at all they'd end their pointless hostility to America and NATO to turn European Russia into a safe rear zone to oppose Turkey and China who could combine to push Russian influence out of Central Asia. UPDATE: Russia would like to have the Montreux Convention which governs access through the Turkish Straits keep NATO ships out of the Black Sea while allowing Russian naval power to have access to the Mediterranean Sea. The 21st Century Eastern Question rages. Europe is not safe from Russia or from itself. NATO remains important for securing America's interest in a continent allied to us rather than used against us with its still potent technological and economic power, as well as its military potential. If Europe’s security doesn’t depend on NATO, U.S. security is almost totally unrelated. NATO was a good idea. It worked to allow Europe to rebuild after World War II, keep the Soviet Union at bay, and integrate German power into Europe. But with those goals achieved, NATO’s purpose in Washington gradually shifted. Today, the United States isn’t in NATO to help important but threatened states balance menacing rivals’ power. It is there to prevent allies from cooperating outside U.S. control and thereby ensure U.S. dominance of European security affairs. Certainly I admit that Europe has the potential to outclass Russia. But Europe's scattered and largely light infantry armies cannot defend the borders of Europe from Russia's smaller but armored and homogeneous army of Russians. Yes, Russia is weaker than the USSR and is still weakening its military with one-year conscription despite high profile new weapons that create the image of renewal. But the Europeans seem to be doing even more damage to themselves. And war is always a contest of relative strengths. Russia can do a lot of damage on the borders, taking much of it if America isn't willing to fight for it; and then put core Europe within reach of Russian arms by making core Europe once again the eastern front of Europe. Europe absolutely needs America to take on Russia. Europe needed America to take on civil war-wracked Libya in 2011, for Pete's sake! Nor is the problem that NATO requires consensus. It does not actually require consensus to respond to an attack--each state can react as it will if one member is attacked. Nothing is automatic although deterrence is served by assuming that. How would a European Union army do better unity-wise unless the EU becomes an actual empire to enforce consensus from the top? I mean, I have no doubt that the Kaiser, Hitler, or the Soviet communists could have organized Western Europe for a more unified military effort had they ever won their drives to control the heart of the continent. And if the European Union becomes the imperial state it is trying to be with its "ever closer union" policy that continues to erode national democracy in member states, Europe will have been taken over by a tyranny from within rather than by invasion. How long will Europe remain friendly in that eventuality, even if the weak European defense capabilities without America present manage to deter a Russian invasion? And American security damn well does rely on Europe. The Atlanticists are silly to call Trump a threat to NATO, as those authors in the initial link note such people claim. But at least the Atlanticists value the strong ties between America and Europe that NATO serves to preserve. We would be fools to abandon Europe after the sacrifices we've made from 1917 to 2019 to keep Europe as free and as allied to America as we can in defiance of threats to Europe's status. Opposing Iran on a broad front is necessary and helps us in the narrow battle for Iraq, where we've been involved since Saddam's Iraq invaded revolutionary Iran in 1980. We can win the narrow front. Senior Iraqi Shia clerics told Rohani that Iraqis would not tolerate Iranian pressure or respond well to Iranian pressure. Iraqis are particularly angry at pro-Iran PMF leaders who keep talking about attacking American troops as part of a campaign to get the 5,200 American troops out of Iraq. Most Iraqis understand that without the presence of those Americans Iraqi would be even more threatened by most of their neighbors (Iran, Turkey and Saudi Arabia). Even many Iraqis who are not particularly pro-American recognize this use of American troops as a “protection force.” The Americans aren’t there to fight Iraqis but to keep the neighbors from making life difficult for an independent Iraq. We need to stay in Iraq to secure the progress we've made--and it is a real victory despite the general failure to recognize the victory. After all, America is still in Germany and still the Germans claim to worry that could go all Nazi on Europe. Maybe we need Nuremberg Trials 2.0. Iraq can become a beacon of democracy and rule of law in the Middle East only if we stay involved to protect and nurture the fragile sprouts of democracy in that dangerous neighborhood made worse by revolutionary Iran. And this help includes helping Iraq rein in the Iranian-created Iraqi militias raised to resist ISIL, some of which are basically Iranian units. The militias are in theory part of the Iraqi military and this leverage must be used to pry Iran's grip from them or disband those that continue to work for Iran. You have to admit that Iraq is important given our repeated military involvement from the Iran-Iraq War (in the Tanker War), to the Persian Gulf War, to the post-war No-fly Zone enforcement, to the Iraq War, and to Iraq War 2.0. Presidents Reagan, Bush 41, Clinton, Bush 43, Obama, and Trump have ordered military action to secure Iraq in one way or another. Obviously it is a bipartisan interest. Wouldn't it be better if we stay involved in peacetime Iraq rather than walk away until we have to use military power to protect our interests? And read the rest of the Strategypage post on Iran's actions. China is a rising power that could have an economy larger than America's by 2030, but they are a mere leaf on the wind depending on which way America blows. Fearful that the United States has grown more determined to undermine his country’s rise, President Xi has doubled down on his determination to strengthen the Communist party’s hold domestically while advancing China’s global influence. I really get sick of people who describe every foreign action as a reaction to an American action or lack of action, as if only America has the agency to make choices. Xi's decisoin to strengthen party rule over China and to strengthen his own rule over the party have nothing to do with American actions to react to China's rise and potential threats to our allies in Asia. So no, America is not to blame for China's clampdown at home. Their rulers are perfectly capable of being oppressive SOBs the way they have been for a couple millennia. And while China is surely rising, as that article linked notes, most countries would rather side with America's view of the world than China's. So even if China is more powerful than America, America's superior geography combined with China's tough neighborhood means we can support neighbors of China to successfully resist pressure to bend the knee to China's power. Mali: at the intersection of no and where jihad and bad government. The French are holding the line there in this front in the war on terror. But the Mali government guarantees that the French are needed to hold the line. I don't believe I've ever challenged the patriotism of Democrats. But if would help the Democrats who angrily deny that Republicans "own the American flag" if Democrats didn't react to our flag the way vampires react to sunlight and holy water. Tip to Instapundit. Some of the reasons the body count among Palestinians in their ongoing weekly attacks on the Israeli border--not protests--isn't orders of magnitude higher. The Navy isn't changing its rules of engagement for Iranian vessels in the Persian Gulf after the president designated the Revolutionary Guards a terrorist organization (and after Iranian threats in response). Hopefully the rules of engagement already say we sink anything that gets too close. The designation is formal now. China won't force the unification with Taiwan yet? Maybe. But there's that "when near, appear far" advice Sun Tsu gave. If China invades Taiwan before American, Japanese, and Taiwanese power regains lost ground as China has armed up, it will look like this, I judge. Will our mission in Somalia really conclude in 7 years? I'm doubtful that we will ever be able to stop "mowing the grass" there to keep the jihadi level low enough. Not as long as we are chained to the notion that the UN member state Somalia bears any relation to the situation on the ground. I'd recognize pieces of Somalia as states and let them decide how to gradually pick up territory they can actually control--or give it to the Ethiopians if they dare. If China is making gains in the information war by exporting their model of a controlled Internet, we need to update our Voice of America/Radio Free Europe/Radio Free Asia model to get apps into operation that will allow people to poke through the Great Firewall to see information from the "wild" Internet. The US (with Japan's equally focused help) is really working hard to get the wreckage of the Japanese F-35A that crashed. Best not to let the Russians or Chinese get their hands on it. As long as Russia doesn't control Belarus, I would not put a full active duty American armored division in Poland. I'd like the ability to have a full division there quickly with prepositioned equipment, but the Russian threat to Poland is limited as long as Russia has to move through Lithuania and Belarus to reach it. And if we build up forces too much in Poland (as opposed to infrastructure to receive reinforcements quickly) we might provoke Russia to take over Belarus. Although Russia's armed forces continue to rot away, making that a risky operation. So Russia would have to be really foolish to risk a war with NATO. So what I'm saying is there is a chance. I don't know what to make of this, but it is certainly more plausible to say that Russia wanted socialist Bernie Sanders who honeymooned in Russia as president in 2016 rather than Trump. Tip to Instapundit. If a "grasp of reality" is required, we're all effed. Via Instapundit. Russian use of irregulars and mercenaries (private military contractors) is really nothing new in Russian and Soviet history. The Indian army is being forced to accept an inferior but indigenously developed 155mm howitzer rather than more of the M-777 that was developed by VSEL Armaments (okay that origin isn't in the post but I am currently drinking from the VSEL Armaments coffee mug touting the XM-777 and AS90 Braveheart self-propelled version). The British-designed M-777 is used by America and other NATO countries, and the Indian army wants more of them. Oh well. China continues to smile at India's dysfunctional weapons design and procurement bureaucracy. In the meantime India's aging and worn out artillery continues to age and wear out. Ah, what's the rush? It isn't like India faces enemies on their borders, eh? To be fair, who could have seen that plan fueled by compassion going awry? North Korea is working on nuclear facilities. I don't trust them. But I don't know if North Korea is successfully buying time or if our military hand has been stayed because North Korea has halted their progress short of long-range nuclear weapons sufficiently enough for us to wait them out. The Navy's big-deck amphibious warfare ships can indeed be used as mini-carrier strike groups. But it only makes financial sense because the ships have a primary amphibious mission and can be used as a mini-strike carrier. It would make no financial sense to build small carriers for the naval aviation mission. Although I admit that precision and stealth make the mini-carriers far more useful than they would have been prior to the F-35/precision weapons combination. Will China's loans to build Belt and Road Initiative projects just leave the host countries with physical assets and resentment toward China over the terms of the loans to build the infrastructure; while leaving China with bad debts that can't be collected but with trade routes through those resentful countries that can't be bullied out of fear of losing those trade routes? I miss the days when human resource departments were one person who hired and fired and kept your records secured. Now they are empires of their own who seek to build a New Soviet Man who is a finely smoothed cog unable to give offense in acts, words or habits. No amount of research identifying ineffectiveness will roll back their power. Tip to Instapundit. How can we not be living in a simulation when the expert discussing unhappiness in men and the scapegoating of masculinity is named "Carla Manly." Luckily I care a lot less about what other random people think about me than other random people would like, I suppose. Oh FFS. Get a life Snopes. Oh good grief, I got an email from Barnes & Noble Wednesday night letting me know I could get the Mueller Report for free on the Nook e-reader. I guess Democrats won't be getting on with their lives any time soon. Please don't forget that despite Russia's efforts to help Trump in the 2016 election they were not for the purpose of getting Trump elected. They could read polling data as well as Hillary's campaign could. The Russian effort was clearly intended to hurt Hillary and weaken her presidency; and to sow chaos and mistrust of American democracy. They guessed wrong on the first part but the Democrats have expanded the latter effect by orders of magnitude, you must admit. North Korea tested a short-range tactical missile. Yawn. This is nothing and counts on people hearing "missile test" and thinking it means a long-range nuclear missile. It does not. Also, North Korea wants Secretary of State Pompeo kept out of the talks? Well good luck with that. That demand might ensure Pompeo is the only person in on the talks on the American side. Well, him and Bolton. Oh, it might have been an anti-tank missile. It was certainly not a ballistic missile of any type. I don't know if this record with Japan's F-35s is a normal thing for a new plane. Russia's "little green men" are far from some revolutionary key to victory. Which is what I've been saying. Those LGM in Crimea spawned the entire "hybrid warfare" craze that is ridiculous. And yeah, as that author says, the European Union has done good work in bringing the ex-Soviet vassal states into Europe. Even though I have serious problems with the EU, I have admitted that the EU represents an improvement over the Soviet Union for those states. "Beto's" rise in the hearts of progressives was as fast and spectacular as his fall. Pete should keep looking over his shoulder. It's a long time to the first primary. Russia has completed the delivery of an order of Su-35 planes to China. Talk about selling the rope that will be used to hang Russia. Iraq's prime minister is visiting Saudi Arabia after his visit to Iran. Good. The Saudi offer of money and relations will help secure a win in Iraq if it can reduce Iran's destructive influence in Iraq. It's about time Arab solidarity takes precedence over the Shia-Sunni divide. 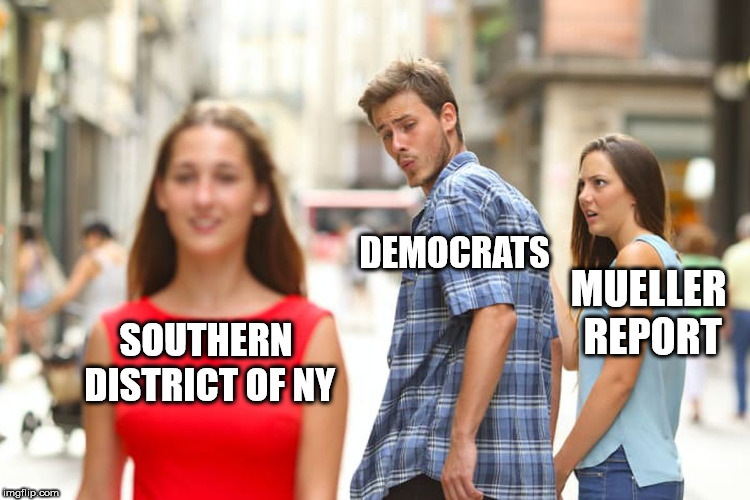 Democrats must be thinking, "Et tu, Mueller?" I imagine Mueller is just one unhinged Twitter user away from being unable to eat a meal in peace in a restaurant. The investigation will continue--but not all on Democrats' terms. This 360 vision system is way better than tiny, filthy vision blocks or sticking your torso out of a hatch. I added this to this post as an update, but I like it enough to repeat it! After two years of telling us that the Mueller report would directly lead to Trump in prison, the shock to Democrats' world view has led them to ignore the report conclusion that there was no collusion and insist the truth is out there. Somewhere. Does this count as collusion? How about this? Do Steele and Hillary have a lot of explaining to do? Trump's people did not collude with the Russians. That's good. Can Democrats say the same of their relationship with the Soviet Union during the Cold War? First two links via Instapundit. Marine rotations to northern Australia continue to build up toward a full 2,500-troop Marine Expeditionary Unit. The deployment was started by the Obama administration. Democrats are stunned that a 2-year investigation with unlimited money and staffed by Democrats who wrote the report ("19 lawyers and 40 investigators questioned some 500 witnesses worldwide. They issued 500 search warrants and 2,800 subpoenas") as slanted as they could were not able to make a case for Trump collusion with Russia during the 2016 election. The investigation should have been able to indict a glass of water with an 'R' on it with that kind of weight--plus media cheerleading--behind it. For all the Democratic talk of "Sure, Trump didn't collude with the Russians--but they didn't tell the Obama administration about it!" developing, remember that the Obama administration already knew about it and neither told the Trump team about it nor did anything to stop the Russians. Oh wait, Obama did tell Putin to "cut it out." I guess not more should be expected, eh? Democrats rightly mock Republicans who claimed Obama was a secret Moslem literally born in Kenya. Democrats still claim Trump is a secret Nazi figuratively born in Russia. Do the math. Tips to Instapundit. A better and more secure Army battlefield Internet is needed to enable my suggestion in Infantry magazine in how to preserve our infantry when they are just spam in a can moving to contact in an infantry fighting vehicle in support of the tanks. By the end of World War II Canada had the fourth largest air force and the fifth largest fleet in the world. They deployed an entire army-sized unit to Europe. And in Afghanistan Canada was one of the few allies who fought and bled at our side. Today Canada is having problems buying 88 F-35s that replace their ancient F-18s to maintain even a rump air force. It won't be long before only the Winnipeg Jets jerseys have any fighter jets in Canada. What the Hell? Tip to Instapundit. John Bolton is losing his edge when he comments on North Korea and the North Koreans offer but "mild criticism" for his statement. If we don't solve our problems, events will resolve them. I just bought new carpeting for my main floor. I got a really good deal on a good carpet. I've long joked that cat food makers should market their food not by animal type but by carpet coloring. If you have tan carpet you buy tan cat food. Because cats will throw it up, and they bizarrely run to the carpet rather than spit up on the tile floor where they started making alarming throat noises. And now I think I should have gotten coffee-colored carpet. I'm sure data is a tool of the patriarchy, or something. I still think the 2016 was essentially an uprising against the Republicans and Democrats who were not addressing their concerns and problems. Trump was an outsider who had a history of being a New York City Democrat, and he won the Republican nomination. Sanders was an outsider who was an "Independent" but was actually a socialist. And but for extreme collusion between Hillary, the Democratic party, and portions of the media, he would likely have defeated Hillary for the Democratic nomination. In 2020, assuming Trump wants to run, Trump will be the Republican nominee. And Bernie Sanders could very well win the nomination for 2020 even if the Democratic party is willing to go to even more extreme and blatant lengths to stop Bernie. Normally outsiders force the party they challenge to adapt to survive. Will both parties adapt to the clear frustration that blue collar voters are signaling with their votes since 2016? Trump spoke to Haftar whose eastern Libyan forces are trying to take Tripoli from the UN-recognized government. It was a mistake to recognize that government which has way too many Islamists and jihadis in it. More and more Europeans are starting to realize that it was a mistake. And stiff-arming Haftar just gave Russia an opening to gain influence there. Hopefully we move on from the mistake. The Tripoli government has counter-attacked. We are going forward to build a B-21 long-range stealth bomber to replace the B-2. Would it be possible to convert some of the B-2 bombers to stealth aerial refueling planes to cope with longer range air-to-air missiles that will be able to keep our non-stealthy aerial refueling planes too far away? ISIL forces killed a couple dozen Syrian fighters in desert regions well west of the Euphrates River, which represents our effective "border" for action. ISIL forces have besieged government forces which provided the opportunity to ambush a relief column. Is this evidence of a post-caliphate insurgency? Peacetime military discipline seems cruel and unusual until the wartime casualties demonstrate it is needed. And yes, despite the war on terror, few troops are in harm's way these days so the military at home is in peacetime mode. In my Army basic training, you'd be dropped for pushups for failing to completely button your uniform. Attention to detail was inculcated that way so you would not screw up with actually important details. It is not cruel to prepare your troops to win and survive battle. I wish Marine Major General David Furness luck in this decision. I appreciate discussions of how China could invade Taiwan. I put less emphasis on beaches and more on airborne assault in my 2005 scenario that I think holds up very well as a template. Although my scenario counts on a rapid assault while the Chinese aircraft and missiles are suppressing Taiwan's air defenses and command and control. And my scenario assumes that China can mobilize without alerting the Taiwanese (and America and Japan) too much and pushing them to mobilize. My scenario assumed invasion under cover of increased security readiness for the 2008 Olympics in China that would provide a soothing explanation for what was visibly taking place. Something else would have to be happening to convince Taiwan that Chinese military preparations were for something other than an invasion of Taiwan. Perhaps that is a fatal weakness of my scenario. I've wondered if Russia will finally stop their self-destructive hostility to NATO in order to focus on deterring a rising Chinese threat to Russia's Far East and threats to Russian influence in Central Asia. And it occurs to me that American pressure under Trump might actually help Russia grasp that course of action. When Obama was president America bent over backwards to be "flexible" to Russia regardless of what Russia did, including interfering in our 2016 election with no push back. Which made it easy for Putin to conceal his appeasement of China by acting hostile to NATO. Now Russia pays a price for hostility to NATO. Might that price change Russia's policy? "Yellow vest" protests continue in France. So aides didn't carry out some of Trump's directives? And that saved our republic according to the Democrats? Really? Trump didn't imprison the aides or take their families captive to compel obedience? Trump didn't disappear them or even fire them in favor of someone who would carry out the orders? That's all it took to stop a new Hitler from creating a dictatorship? Huh. Good to know. At this point I assume this kind of thing is business as usual in any White House and that the only unique thing is that the media publicizes it. Why do I say that? Because while I am not happy to have a president who is crude and has said rude things about women in addition to being unfaithful to his wife, Johnson was far cruder and both Kennedy and Clinton had far worse records with treating women and infidelity. The difference is that the media minimized, excused, or ignored the offenses of those Democrats. I admit I am looking forward to the post-Trump era for those issues. But I remain ecstatic that I'm not enduring the present waiting for the post-Hillary Clinton era. Ah Hell. Eight blasts at Sri Lanka churches and expensive hotels on Easter. There are more than 160 dead as of writing this. And two were carried out by suicide bombers. During the civil war there, suicide bombings were routine. So that fact doesn't automatically mean Moslem--who are about 10% of the population--jihadis did it. And if these are Islamic jihadis, is Pakistan's hand in this? Suspects have been arrested but no motives are disclosed as yet. We have a winner in Ukraine. I have no idea what to make of this development. He barely speaks Ukrainian but voters are apparently completely frustrated about the glacial pace under the current president of the battle against corruption--which as I've noted is necessary for Ukraine to defeat Russia. Isn't this ridiculous issue settled yet? Recovering from Soviet communism was hard enough for Slovakia and other former Soviet vassals--even with the active help from Western democracies since 1991 tp provide physical security and assistance in building the governmental and societal institutions for rule of law. Imagine how much harder it is for Iraq--continually under assault by jihadis and Iran since the overthrow of Saddam--and why an Arab Spring is a long-term project that will span many generations even with outside help. For a long time, India's leaders (with some reason) feared coups more than they feared foreign invasion. As long as Pakistan was the main threat, size mattered. Times change. India hasn't had a coup in the modern era. India's government enabled a corrupt military and society. And then equally large China rose in power far beyond India and can now make good on Chinese claims against large portions of India's territory. The rapidly modernizing Chinese military and increasingly aggressive Chinese demands to settle old border disputes has forced India to take a realistic look at its defense spending and the current state of its armed forces. For the first time in its history the modern state of India faces a very real military threat. That’s because China considers colonial era border agreement illegal and wants 90,000 square kilometers back. India has refused, especially since compliance would mean losing much of the state of Arunachal Pradesh in northeastern India and some bits elsewhere in the area. There is one glaring problem with this Indian situation. The more Indians examine the state of their own military, especially compared to what China is doing with its military, there is growing alarm. China not only spends more than three times as much as India each year on defense but gets better value for what it spends. China not only spends much more on modernization (and has the equipment to show for it) the Chinese procurement bureaucracy is far less corrupt and inept. While both nations have problems with corruption China has made a more determined effort to curb the corrupt practices in the military. India is only starting to uncover hidden corrupt practices that generations of politicians and bureaucrats have deliberately ignored (and profited from). But with the growing Chinese threat there have been a more investigations and honest audits of the Indian military. This is not to say that the Indian military is inept. It has not just relied on mass to defeat Pakistan in wars. And India does have combat-experienced leaders. But size was the ultimate safety net. But China is now the primary threat to India. What was once good enough to provide a solid margin of error against smaller Pakistan (which is why Pakistan uses nukes to deter and terrorists to fight India) is now clearly insufficient to prevail against China if China makes a serious effort to humble India in war. The bad terrain in the north may limit China's capacity to take more than the disputed border region--although Chinese infrastructure construction is eroding that shield. But the loss of that territory would be a large blow to India. But would it be a large enough blow to make any Indian nuclear threats to deter China from attacking credible? When China has nukes, too? I think that in the long run India's democracy will give them the edge over autocratic China. But rule of law is the source of that edge, and India has yet to come to grips with defeating corruption to provide that edge. So India has to survive the short and medium runs and set the conditions to prevail in the long run. Will they? On the bright side, China will no doubt falter in their rise. So India has a chance. In the long run. While I think it is appropriate for America to consider how an expeditionary Army could assist India against China, as part of a general move to see how the Army can contribute its core capabilities to a war against China as I discussed in Military Review, we have to be wary of the risk of exposing our force to defeat if the Indian armed forces can't hold the line against the now-obviously superior Chinese military. We have to consider that simply increasing military-to-military cooperation between America and India isn't nearly enough. We need to help India develop rule of law (but don't let any of our Chicago officials participate). Maduro and his government had refused humanitarian aid because they deny a humanitarian crisis exists. Maduro blames Venezuela's problems on "sabotage." Who are the saboteurs? Neighboring Colombia, the U.S., oil companies, capitalism, etcetera. The real blame lies with Maduro and his predecessor, former army paratrooper Hugo Chavez, founder of the so-called socialist Bolivarian Revolution. Chavista authoritarianism and the corruption and repression socialism inevitably creates crippled and impoverished what was once one of Latin America's richest nations. The country's daily oil production is a third of what it was in 1999. According to the International Monetary Fund, Venezuela's inflation rate in January was 2.6 million percent. Maduro uses food as a weapon against his own people, just like the Soviet Union did. In July 2016, Venezuela's food shortages were so severe the military took charge of food distribution. In January 2017, the army took control of food imports. Maduro's supporters immediately benefitted from this militarized system. They had and still have access to food. They can also demand bribes from starving citizens in exchange for food. Unless Brazil, as the largest state in South America, can be convinced to lead a coalition of the willing to topple Maduro (with America providing logistics help for the operation and for the humanitarian aid surge needed), I don't know how this ends well before a lot of people starve and flee to neighboring countries to spread disease and destabilize the host countries. Russia and China (and Iran and Cuba, too) of course feel no shame for backing that scumbag Maduro and his socialist tyranny plundering the wreckage of Venezuela. UPDATE: Guaido exhorted opponents of Maduro to make May 1st a massive rally to pressure Maduro do leave. That would be effing fantastic! But can we get it? Being highly mobile and transportable while also being protected and lethal is certainly the Holy Grail of armored vehicles. The Army should not spend whatever it takes attempting to meld multiple revolutionary technologies into one vehicle for all missions. The FCS should be different from the Abrams and Bradley but must be designed with near-term technology that incorporates modular improvements if the Army is to turn “gee whiz” ideas into actual hardware. Separated missiles and a sensor grid; active defenses; EGTs; and exotic engines, fuels, and weapons can be retrofitted to defeat more capable enemies. Barring successfully fielding exotic technologies to make the FCS work, the Army must consider how it will defeat future heavy systems if fighting actual enemies and not merely suppressing disorder becomes its mission once again. The tentative assumptions of 2001 will change by 2025. When they do, the Army will rue its failure today to accept that the wonder tank will not be built. In practice, recon vehicles must be heavy if the opponent is a tank-based modern army. "Agile" recon vehicles just sit there in a spreading slag of their own too-light armor melting around the dead crew. That's not agile in practice. The Marines cannot build the wonder ARV. Ask the Army. Iran and their Shia Houthi allies are even willing to allow humanitarian aid to Yemen's people if it buys time to reverse their losing war effort. The Shia rebels now say they will finally implement the December peace deal that was supposed to reopen the Red Sea port of Hodeida, which is essential for delivering emergency food and other aid to northern Yemen. Iran had persuaded the Shia rebels to stall but that advice lost its appeal as the rebel situation worsened everywhere, not just at Hodeida. Iran had problems of its own at home and elsewhere and as not been able to help much. While the rebels have stolen and stockpiled a lot of food and other aid their coalition continues to unravel and lack of aid coming through Hodeida is one reason. The Saudis have started alternate supply routes for humanitarian aid. If the Houthis wreck Hodeida and burn supplies they will obviously be the bad guys even to the media and Congress which have fallen for Iranian propaganda hook, line, and sinker by demanding America abandon the Saudi-led coalition. With a ceasefire the Houthi will attempt to move their troops out of Hodeida to the areas under pressure by their growing list of enemies. And of course, al Qaeda and ISIL are trying to survive the fighting, providing America with plenty of reason to back the Saudis and hunt Sunni jihadis on our own. As of the beginning of the month, we've launched 8 UAV strikes this year on such targets. And an attempt to hand Iran a victory, don't forget.